Marina Del Rey is by far the newest of Los Angeles’ beach communities. 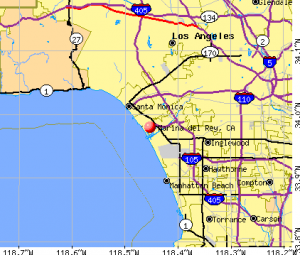 Santa Monica and Venice to the north of Marina Del Rey and Manhattan, Hermosa, & Redondo Beaches to the south were all founded in the early 1900’s. Marina Del Rey is an unincorporated part of Los Angeles County and the Marina itself wasn’t dedicated until 1965. Many buildings in Marina Del Rey include a land lease from the City of Los Angeles that can push your monthly payments up as much as $900. This has led to reasonably priced condos with exorbitant HOA dues. Marina Del Rey’s boundaries include several tracts of modest Ranch style homes from the 1940’s and 50’s along with several newer developments of townhomes and single family residences to on the north side of the Marina. The district’s boundaries to the east across Lincoln Blvd. also include several more very reasonably priced mid-century tracts of ranch style homes and a number of new contemporary loft style condominium complexes which are very popular. 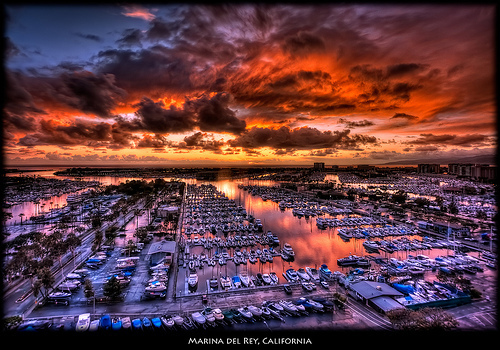 Marina Del Rey is the biggest small boat harbor in the country. It’s also in an unincorporated part of Los Angeles County which was once part of a large coastal estuary that’s been the epicenter of newer development by the beach for the last fifty years. Marina Del Rey is actually collection of very different areas including the beach front and canal houses and luxury condos of the Marina Peninsula, the mega-complexes, lofts, and sparkling residential towers of the Marina itself, and the mid-century suburban neighborhoods to the north and east.